Danielle, Gr. 8, has been playing hockey since she was 5 years old. Prior to this season she played boys rep hockey at the Burnaby Winter Club, and later at the Arbutus Club. Last season she was the assistant captain of the (boys) Peewee Rep team, which won the BC Provincial Tier 4 silver medal. 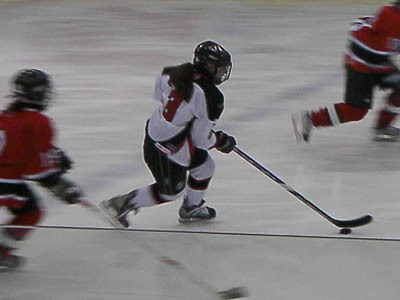 This season she moved to the girl’s league, and played for the Richmond Ravens Bantam Tier 1 team. The Ravens had a very successful season, and won the opportunity to compete in the BC Provincial Championship series March 19-23 in Kelowna. After beating teams from around the Province, the Ravens won the silver medal.